Finally, the best unsigned band in New York has a place to call home. Syracuse, NY based quintet Ra Ra Riot has signed to Seattle’s Barsuk Records. The group’s debut full length, The Rhumb Line, will be released in North America on August 19th, 2008, and in Europe (on V2) later this fall. Formed in January 2006 in Syracuse, NY, Ra Ra Riot has quickly gained a devoted following. They have toured extensively in the US and abroad with artists such as Tokyo Police Club and Editors. NME honored them as one of the Top 5 and Top 10 bands at CMJ 2006 and SXSW 2007 respectively. Their self-titled EP has garnered acclaim from Rolling Stone, Nylon, Spin.com, NPR’s “All Songs Considered”, and many others. 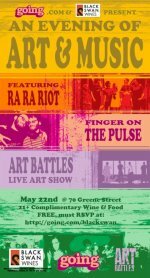 In other news, Ra Ra Riot will be playing a free show with Finger on The Pulse at 70 Greene St on Thursday night. RSVP to that show over here.